If your roof is covered in moss we can help as we provide a professional roof cleaning and roof moss removal service in Aylesbury and throughout Buckinghamshire. The damp climate in the UK can create the perfect conditions for moss, algae and lichens to thrive on a roof. Not only does moss look unsightly but it can also cause other problems such as gutters and downpipes becoming blocked. In addition, the extra weight of wet moss can cause stress on the roof structure. What's more, during winter the freeze-thaw process may cause tiles to break. This can cause premature degradation and the appearance of your roof to deteriorate. Plus it could also cost you a substantial amount of money in roof repairs. With a huge variety of housing stock in Aylesbury, ranging from the newer large town developments to historically appealing properties; many of these homes suffer from significant roof moss growth and algae spores. The moss and algae deteriorate the overall visual appeal as well as block gutter systems and make ground floor areas unsightly and slippery as clumps of moss lay on the floor. Getting your roof cleaned can make a major difference to the aesthetic appeal to your home or business. 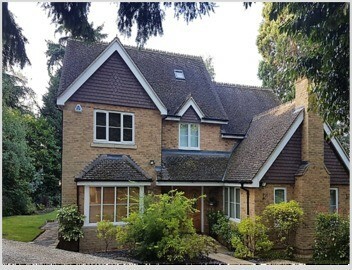 Many property surveys nowadays soon pick up on the roof moss that can be layered quite thickly on your prospective home purchase, with a recommendation that the moss is cleaned from the roof tiles. Smartseal UK's registered contractor directory deals only with long-established professional roof cleaning and roof coating companies. All contractors are self-employed locally based firms, who use the most up to date cleaning and coating methods available. 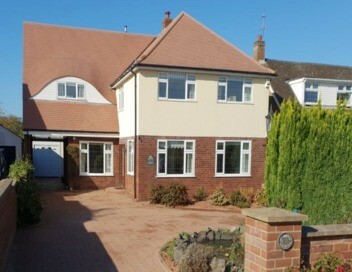 Once your roof cleaning has been completed, any roof repairs identified are put right, with ridge tiles and valleys having eroded mortar replaced, along with any cracked or broken tiles replaced with locally sourced roof tiles. We recommend, dependant on tile type, the application of either a clear, solvent free, impregnating sealer or a coloured coating that will reintroduce a superb depth of colour that looks entirely natural. If you have clay or slate tiles the clear impregnating sealer will keep the tiles protected from the elements and looking fresh and clean for years to come. If you have concrete tiles then you can still use the clear sealer to retain the look. 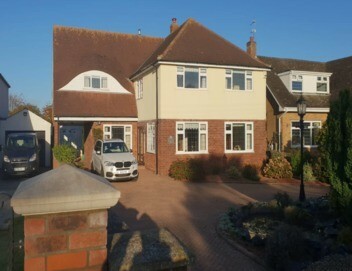 Many homeowners in Aylesbury opt to have either their roof painted to make the roof look like new again. 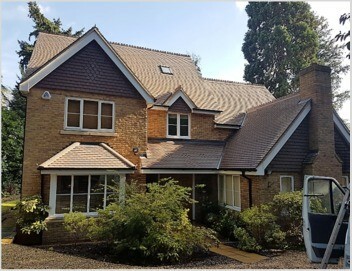 Our Climashield™ roof coating and the sealing product has been extensively tested achieving international accreditation and comes with a 10-year guarantee if applied by a Smartseal registered contractor. If you are thinking about getting your roof cleaned, all roof moss removed, checked for roof repairs and then protected and made to look like new with a roof coating, please call us on 0800 849 9498 or complete our online enquiry form and we will organise FREE roof cleaning quotes for any property in Aylesbury plus all the towns and villages in Buckinghamshire.